broken sections are twelve inches in diameter. I'm still experiencing significant aftereffects of the storm—power was off for 30 hours and it's been restored, but unfortunately several circuits in my house are dead, including my entire office (and that whole end of the downstairs). I assume this has something to do with the handoff between the backup generator and the power from NYSEG (pronounced "nice egg," our local power utility), but I haven't yet been able to get through to anybody who can help. So I'm breaking my rules and writing from the book computer, upstairs. Hopefully just for today! They had a lot of snow in Britain and Ireland too, I hear. Yesterday and the day before were days to be prized here—dramatically gorgeous—and I did what was, for me, a lot of shooting. I went out several times. Two things I noticed to mention. For one, I actually filled up a whole card. "Ran out of film." Many of you probably do this regularly, and have long ago worked out protocols for making sure you have extra cards in reserve and handy. But I habitually shoot sparingly, normally of static subjects, so I ordinarily spend a lot more time thinking and looking than I do actually shooting, and it's been so long since I've filled up a whole card that I can't even remember the last time. So on my third jaunt out of the house...whoops. No more card space. It's also been a long time since I left the house with anything more than one clean card in the camera—I just so seldom need it. I think this was because, much to my surprise, I found myself shooting action. I don't usually do much of that. I'm guessing those of you who shoot action are used to shooting a lot of exposures. Or at least a lot more than I usually do. And that brings me to my second observation, which is that whenever I go out meaning to shoot something, I almost always end up shooting something else. I first learned this when I spent a year shooting with a view camera long ago (I'm not naturally a large format guy, as I wrote about years ago). Frustrated with my tendency to shoot carefully pictorial compositions, once I just swung the camera around and took a picture of what was behind me. Then I started doing that whenever I set up the camera, and found that the "behind my back" picture was better about one out of five times. That thought was expressed to me by the great Ralph Gibson when I interviewed him many years ago. Paraphrasing, he told me something like this: I've been doing this for so long, and I'm good enough at it, that whenever I head out with the camera I know I'll come back with something. Or actually, it teaches two important lessons: the second is that while you're shooting one thing, remember to stay alert and alive to every other possibility, everything else around you. Even when you know where the pictures are you never know where the pictures are. Anyway: fun day, out an about with the X-T2. Shooting is fun and it cures all the other ills associated with the hobby of photography. I did some more documenting of my downed tree, too, which is an ~80-foot oak (I paced it off), about three or four feet in diameter at the base. It came up by the roots because the ground is so soft now. It was a violent event: the fall snapped many living branches, some of them eight or ten inches in diameter, raggedly in half; the corpse of the tree in the yard is a jumble of broken wood and tells a vivid tale of the forces of the fall. I don't have my usual footer macro up here to add to the bottom of this post, so I'll just sign off and leave it at that. More anon. March has been quite the month so far. Bryce Lee: "Running out of space on an SD card is interesting. Normally those of us who were raised in the era of 20- (later 24-) and 36-exposure rolls of film learned early on to be small 'c' conservative when deciding upon exactly what we want to photograph. I still function in film mode when out doing my photography, regardless of the capacity of the inserted SD card. An old habit difficult to break." Stan B.: "'I don't care so much anymore about "good photography." I am gathering evidence for history.' —Gilles Peress." 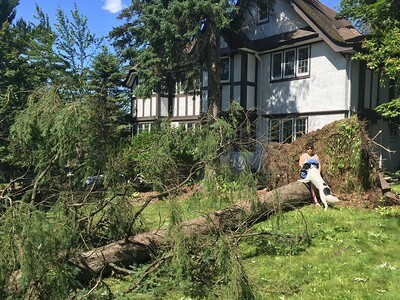 Joseph Reid: "One of the best yard-care/exercise experiences I had while owning a house in Upstate NY was having a sick tree felled professionally and the trunk cut into two or three long sections. Then I took over and made firewood out of them using wedges, sledgehammer and axe. I could only do a bit at a time and it took several weekends. But it was great, exhausting stress relief. Splitting those trunk sections was a primal experience." Joe: "Re 'Even when you know where the pictures are you never know where the pictures are.' Oh my, yes. So true. And that principle brought me to a habit that I've developed: When I'm shooting a subject, of course I always reach a point where I'm finished. I've covered all the angles, I know I've got the good shot in the camera, I've done what I came for. I'm tired, it's in the can, and I'm eager to go home and dump the images onto the computer. But for the past few years I've made it a habit to stop and take a one-minute break to walk through the location, looking up and down and behind and inside, thinking: what else is here? What did I miss? Isn't there one more shot I can take home? I swear, 50% of the time I'll frame a shot that hadn't occurred to me before, and 50% of those times my favorite shot will come from that last idea." Mike replies: That comment says the same thing my post did but much better. Lovely. Ann: "About 20 years ago, we lost a 30-foot oak. No storm, no soft ground. I was just sitting at home reading a magazine one night, and it fell over with a huge crash. Rotten at the base of the trunk. The interesting part was that we had just the week before finished building a six-foot-tall cedar fence. The tree fell on a section of that beautiful, sturdy, brand new fence. The posts on either side of where the tree fell were intact and standing up straight. The section that the tree hit, however...shattered. Not a single piece of wood left in between those fence posts that was longer than six inches. That falling tree was a powerful force." Sounds like your electrical problem is as you suspect in your transfer switch. Most are automatic, some older ones are manual, I had one of those before my new system. Get a qualified electrician to check it. Not a bad time to do maintenance on your generator either---they do need periodic maintenance. re documenting stuff, over the years, those kind of pictures almost always become more valuable to you and others. Now most times we do it with our phones but those are rarely archived the way pictures taken with 'more serious cameras' are. But they should be, because some and more they are the chronicle of our lives. Would the tldr version be "Shoot like a news photographer"? Good to hear from you. Fingers crossed that the electrical problems are simple. I share your observations about getting something, often not what you expected. Though I do have the occasional day where I am quite pleased with many shots on the back of my camera, only to return home, look closely, and dismiss every one of them on the computer. Maybe if I printed at 3 x 2 inches I'd like them. Yesterday I was reviewing older photos, as I do, and found a "documentary" of my daughter's first apartment, mostly close-ups of stuff of the shelves, art, furniture, the shower curtain, a collection of condiments. I remember enjoying doing that at the time, and while the photos are not great, I think it will be fun to look through in later years. I also documented with an iPhone our own tree damage from the summer of 2016, when our power was out for a week. As I'm sure about a zillion people have already suggested, I assume you've checked for tripped breakers (or blow fuses if the wiring is that old). I'll also mention that we found in our house that in addition to the main panel at the service entrance there are also several additional fuse boxes scattered around (apparently the original builder was a real belt and suspenders kind of guy). So you might have a bit of a treasure hunt. Hope you get it fixed soon. "...which is that whenever I go out meaning to shoot something, I almost always end up shooting something else." Isn't this fairly normal? I find that when I go out with a specific idea in mind, I nearly always come back with extra 'non-project' images. Sometimes they are better than what I went out for. I expect that you've got the two 120 volt lives and one neutral electrical supply that seems to be common in the USA. I think you are missing one live. If you have any 240 volt appliances (probably the ones with heating elements) you then find that they don't work either. It could be just your house or it could be more widespread. Ask your neighbours if they have the same problem. Whether they do or don't, it's a clue to what's happened. "Frustrated with my tendency to shoot carefully pictorial compositions, once I just swung the camera around and took a picture of what was behind me. Then I started doing that whenever I set up the camera, and found that the "behind my back" picture was better about one out of five times." Many years ago I started doing something similar on my periodic walks through a local park in search of a worthwhile image. About every 100 feet, I turn around and look back where I came from. This sometimes yields an image as satisfactory as anything in front of me. RE: Something and Something Else... to sort of echo your comments about looking around when you go out to shoot something you've planned to shoot, I do something I call "explore the space". That means look up, look down, look around to see what else is interesting, at least outdoors or at sporting events. In the studio, I've always had a vision of what to shoot...but in shooting, I've (almost) always had new ideas about the vision for that shoot...hence, "explore the space"...as I've always found different arrangements or poses or lighting that generate different images from what I originally envisioned. Sometimes those images are better than my original vision; other times they simply enhance it and leave me with more images. It's a good thing all around. Good luck with your trees and power. Here in NOVA we lost power in our neighborhood for only about 18 hours but didn't have snow, just wind. I just wrap a 32 gb card in a $20 bill and stick it in the hard to find emergency stash section of my wallet. That money you're saving up for new camera? Chainsaw might be more useful up there in the woods. Just sayin'. Snow pics? I sense that you are not enamored of HDR, but ... works a treat on snow and sunshine and trees. Sounds like you had great fun with the new camera! Normally, when I lose power, as long as the modem, router switch and various Airports are on generator power, I keep my internet service, --a reboot is sometimes necessary. Not this time FIOS was down for the duration. One of my units has Voltage in voltage out meters and I happened to be near it as power went out a while back. That's enough to fry delicate stuff. When we lose power here, the neighborhood is usually the first to go and the last to come back. Although they did dig up the road last year and put in all new cables and power appears to be a bit more stable these days. During big wind storms we have lost a tree or two over the years. During a big storm when we first moved in, we lost a 90ft tall Douglas Fir that took out the neighbors truck across the road. I have filled up SD cards before so I carry extras in my bag along with batteries. My current camera has two SD cards and is set to fail over to the "empty" one in slot 2. This only happened once, in Scotland, shooting some Highland Games at seven frames a second. My workflow is to store images in day tagged folders and copy the day folder off on to a portable hard drive. I usually get three or four days on a 32GB card - and I do not shoot video. I remember the golden olden days on photography forums when the argument was don’t even think about using a large capacity card, something as large as 8gb because you don’t want all your eggs in one basket. I was always on the other side of that. I would buy the latest, greatest, fastest, biggest capacity card then available. I’m now shooting 128gb SQD in D850 with a type II 256gb SD in the other slot as the spillover slot. Chances of running out of card space are quite slim. Oh here in Westchester (pronounced west chester) County, NY we still have no power. Thank goodness for my 22kw Generac. But the propane bill will cost more than a passel of large capacity cards. "Out of film." That reminded me of an incident several years ago that still brings me a chuckle. My wife and I were on a two-week rafting trip through the Grand Canyon. Most days one of the guides would lead the group on a hike up a side canyon. With us on one such hike were a couple of nice Millennials, engaged to be married. On the hike I reached the end of the roll of color slide film in my FM2. I asked the group to pause so I could change my "memory card." Rewound the film into its cassette, opened the back of the camera and removed it. One of said Millennials blurted out, "Hey, that's not a memory card!" I replied that it's an analog memory card. Good to hear you got out and about. I did the same thing Saturday. I'm always mindful to continue to "work the scene" when I find a location I want to shoot in, so the comments here are accurate and helpful. On another note, you're going to miss that X-T2, I'm certain of it. My interest is in chiaroscuro. Artists have been using it for hundreds of years before the invention of the camera. And I'll be using chiaroscuro long after my cameras are gone. No serendipity in my work. Everything is scouted, and test-shot (if need be) in advance. Once I've built the shot, in my minds eye, then I have to create the lighting. The cinematographer Owen Roizman defined available light as every light available on the truck. To this I'll ad all the grip equipmet on the truck—I like bounce light and scrimed/blocked sunlight. I worked as a pro photographer for about 30 years, and many of my clients were ‘low-doc’, a term I borrowed from the financial industry—they were small businesses without too many resources (often including imagination!) and I had to do the silk purse thing to the best of my ability. I can walk around my local area and find satisfying shots, often close-range details, but would love to be able to move further afield; I cannot afford a motor vehicle. Hitting the buses tomorrow to photograph two interesting advertising signs, posting on GetDPI later!. @ Mike said: “Then I started doing that whenever I set up the camera, and found that the "behind my back" picture was better about one out of five times.”. I have found that that is the key to candid people photography in crowds, at festivals, speeches, performances, etc.. Turn around and shoot what’s behind you—the people and their reactions. I’m very glad that that tree did not fall on your house! You think you’ve got problems now? Last year a huge old dead tree pull out by the roots and fell onto the back of our house with a huge crash. We were in another room watching TV and had one of those WTF?? moments. Fortunately it mainly fell onto our screened in porch and missed most of the main house. It took a bunch of lumberjacks a few hours to cut up the tree while swinging around on ropes, and then we just left the pieces in the ravine. Now they are squirrel condos.